This advertising poster is appearing at a bus stop near you. Imagine the surprise of many fans as they are driving along and stumble across this poster! The dimensions appear to be approximately 4x6 feet. 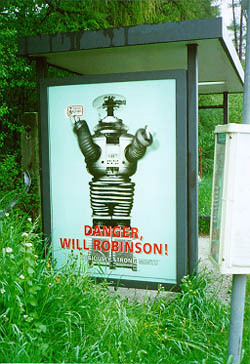 The poster contains the phrase "DANGER, WILL ROBINSON!" as part of a plug for Altoids Mints. The most famous fan produced poster is the Lost in Space movie poster created by Ray Fagundes in 1989. The poster has been reproduced in several publications. 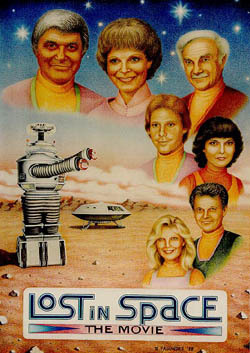 With the hope of a Lost in Space movie being made rapidly diminishing during the early 90s, Ray's "reunion" movie poster helped maintain the spirits of disillusioned fans. (MOLISC) Your poster is dated 1988 and therefore anticipates the actual NLC movie release by ten years. Did you think it would take this long for LIS to hit the big screen? (Ray) I had hoped that my poster would somehow bring attention to the possibility of a reunion movie with the original cast. After Guy Williams passed away, and later Irwin Allen, I figured that the chances of a Lost in Space movie were almost nonexistent. (MOLISC) Your hopes must have been dashed when IA passed away in 1991? (Ray) Yes. It was sad news and such a disappointment to hear that he passed away just when he was starting to get interested in the idea of a LIS movie. (MOLISC) What inspired you to create the poster? (Ray) I would have to say the "Star Trek" movies (and to a lesser degree, TV reunion movies of the 1980's). "Lost in Space" had always been a favorite show of mine since childhood, and I felt it was time for a "Lost in Space" movie. Again, I felt the poster might bring attention to a possible movie. (MOLISC) What did you use to create the poster? How long did it take to do? (Ray) I used oil-based color pencils (Prismacolor Pencils). Some black ink is used in the LIS logo at the bottom of the poster. The illustration took about three to four months to complete (in my spare time). (MOLISC) Since your poster shows the original cast, it's obvious that it never crossed your mind that they would not be selected to play in the main roles. What is your impression of NLC's movie casting? (Ray) It is not what I had imagined, especially William Hurt as John Robinson. (MOLISC) When you drew the poster did you have a particular script in mind? Perhaps a rescue script? Or were you thinking of Bill Mumy's much publicized script? (Ray) I had read about Bill Mumy's script around that time, but I didn't really know what the plot was about, until sometime later. I thought it would be nice if the Robinson party either made it back to Earth or finally made it to an already colonized Alpha Centauri. (MOLISC) Did you base your cast portraits on contemporary photographs of the cast or were they drawn as you imagined an older cast might look like? (Ray) I was able to obtain current photos of most of the cast from their agents (such as Bill Mumy, Mark Goddard, Marta Kristen, June Lockhart and Angela Cartwright). For Guy Williams and Jonathan Harris, I had to rely on fairly recent magazine photos (I believe from Starlog). (MOLISC) All of the cast members in your poster are facing basically in the one direction except Penny. Is there any symbolic explantion for this or is it just a question of design? (Ray) Basically, it was just a question of design. But, actually Professor Robinson and Penny are facing about the same direction. (MOLISC) Your poster is a little unusual as it gives emphasis to all cast members plus the Robot and Jupiter 2. Most contemporary posters usually concentrate on particular piece of action or just one or two of the main characters. Was this deliberate on your part? (Ray) I wanted everyone (including the robot) and their ship, the Jupiter II, to be represented. I once saw a "Star Trek" movie poster which was similar in the way it presented the cast and the Enterprise, and I especially liked it for that reason. (MOLISC) Do you have a favorite character from the old series? (Ray) Aside from the robot, I guess it would have to be Will Robinson. Not to lessen the other cast members (I enjoyed every one of them), but the robot always fascinated me, especially as a child.